This article first appeared in the June 2018 edition of Australian Aviation. It’s the little airline with a big heart. 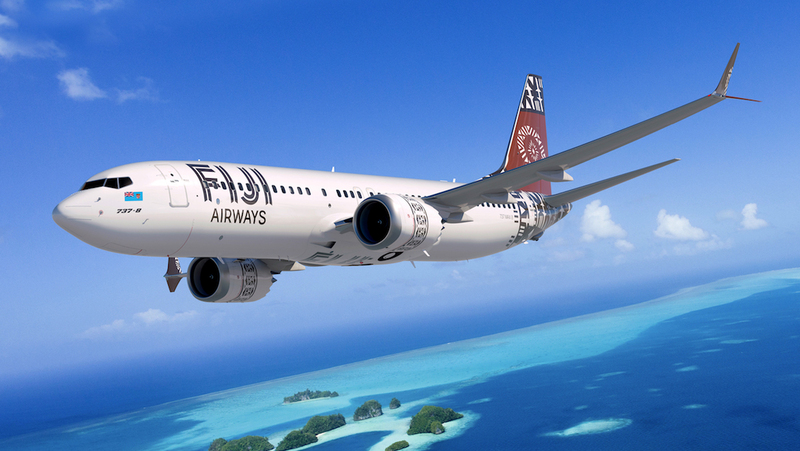 In the South Pacific, where history suggests financial success for carriers is hard to come by, Fiji Airways has broken the mould with four years of consecutive record profits. And the future is looking just as sunny. When it comes to the scattered, sparsely populated islands of the South Pacific, more often than not, headlines about their airlines have been along the lines of: “Trouble in Paradise”. For years, too much capacity and not enough passengers have been the backdrop to financial instability, volatile results and even collapse. Not any more for Fiji Airways, which has chalked up four consecutive years of record profits and appears to have found a recipe for success. At its headquarters at Fiji’s international gateway of Nadi the staff are reaping in bonuses as the carrier gets ready to take delivery of new aircraft and further expand its global reach. Not only will five Boeing 737 MAX 8s begin arriving this year – two will come in November and December and the remaining three in 2019 – bringing more significant savings in fuel costs and economics, the airline’s management has begun the process of looking at what it will buy to replace its long-haul fleet of Airbus A330s. It has, indeed, been a busy 18 months for the carrier as it adds a fifth A330 that will enable it to launch flights to Tokyo Narita in July, its fifth long-haul destination after Hong Kong, Los Angeles, San Francisco and Singapore. Capacity expansion across Fiji Airways’ short and medium haul network is also planned for late this year and early 2019, as it replaces its five 737NGs with the five higher density 737 MAX 8s. The airline expects to achieve eight to 10 per cent growth in 2018, and an even higher rate of growth is likely for 2019, according to Viljoen. All of this has come on the back of more than healthy financial results. In March the group announced its highest ever profit before tax of A$61.9 million for the fiscal year ended December 31 2017, a 13.4 per cent increase over the previous financial year’s $54.6 million. The Group (legally known as Air Pacific Limited) comprises of Fiji Airways, its subsidiaries Fiji Link and Pacific Call Comm. Ltd, and a 38.75 per cent stake in the Sofitel Fiji Resort & Spa on Denarau Island. Group revenue was $599.8 million compared to $532.9 million in 2016, an increase of 12.5 per cent. Passenger numbers rose 14.3 per cent to 1.6 million. For staff at all levels it has meant a healthy boost to their bank accounts, with profit-sharing arrangements meaning eligible non-management staff of Fiji Airways and Fiji Link will each get a payout of around $2,800 and managers getting no less than $6,400. This is in addition to quarterly bonuses of up to $750 per year that non-management staff of the two airlines already stand to earn for achieving key objectives. That all adds up to a more than happy workforce. Viljoen has been driving constant improvement in the carriers’ operations since he took charge in October 2015. With 33 years of experience in the airline industry he has turned out to be an inspired choice. A chartered accountant who holds an Honours Degree in Commerce, he started his airline career with Comair in South Africa in the 1980s as financial manager, rising to the position of group financial and commercial director, which he held for more than a decade. He played an instrumental role in elevating Comair from a small regional airline to becoming South African Airways’ principal domestic competitor flying the British Airways brand. In 1992, Viljoen joined South African Express Airways, the largest regional airline in the country, as chief operating officer, devising and leading a turnaround program to restore the airline back to profitability and to expand its fleet to include regional jets. In 1995, he joined South African Airways as chief financial officer and took over as president and chief executive in 2000 until 2005, implementing an aggressive transformation program known as “Perfecting the Basics” which restored the airline back to profitability. In 2009, he joined Air Mauritius, initially as chief financial officer and then from 2010 as chief executive, again launching a successful turnaround program known as the “7 Step Recovery Plan” that got that carrier back into profit by 2014. It was just the sort of record Fiji Airways needed. When the Government of Prime Minister Voreqe Bainimarama was appointed in 2007, Fiji Airways was in dire straits. But with the right policy settings, a new approach to industrial relations and government support, the airline has not only been saved but is flying higher than ever before. The groundwork was laid by Viljoen’s predecessor, German-born Stefan Pichler, a former chief commercial officer of Virgin Blue and chief executive of Jazeera Airways, although since leaving Fiji Airways in 2014 his career hasn’t been so successful. He became chief executive of the doomed, Etihad Airways part-owned Airberlin, which collapsed last year. 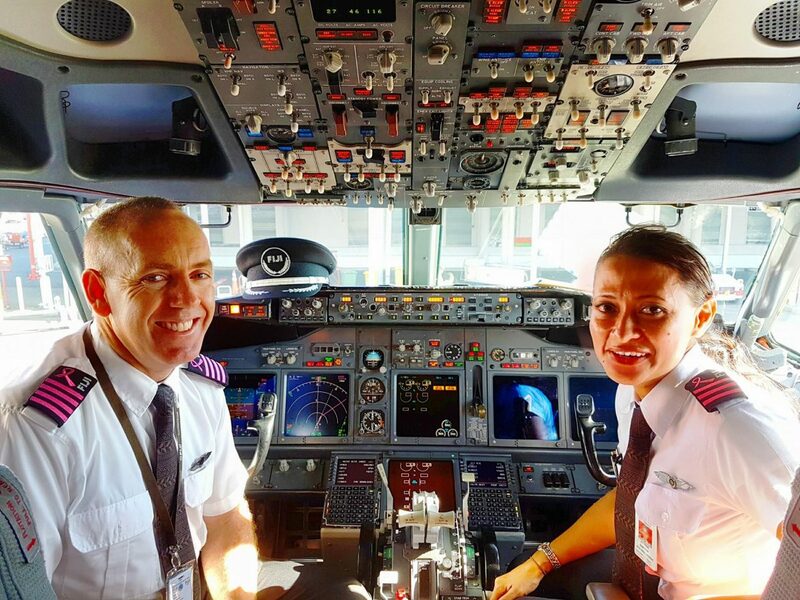 In Nadi, however, his successor has been far more fortunate, building an impressive reputation for pushing through transformation, including a focus on improving the service culture at the airline. Last year, 86 per cent of the carrier’s 1,384 staff completed Phase 1 of it’s “UP! Your Service” culture-building program designed by world-renowned service expert Ron Kaufman. This resulted in Fiji Airways reducing customer complaints by 66 per cent while increasing compliments by 22 per cent compared to the previous year. Fiji Link increased compliments by 74 per cent. It also opened a new Fiji Airways Premier Lounge, a world-class Business Class lounge at Nadi International Airport, the first-of-its-kind for the region, complete with a number of special features including chef-inspired menus, baristas, luxury spa and nanny service. It also upgraded its Premier and Priority Check-in counters at Nadi and progressively rolled out kiosk check-in at various airports, as well as launching a revolutionary Resort Check-In product, allowing guests to check in for their flights from the Sofitel Resort and Spa on Denarau Island. Operationally, a key plank in Viljoen’s strategy has been to forge stronger codeshare links with partner airlines as a way of extending the airline’s network reach. They included new agreements with India’s Jet Airways and Hong Kong Airlines, as well as the extension of codeshares with Qantas, Cathay Pacific and Alaska Airlines. In December it also signed a codeshare deal with Jetstar covering domestic flights in New Zealand. Altogether, the deals have increased the total number of destinations on the network to 106. 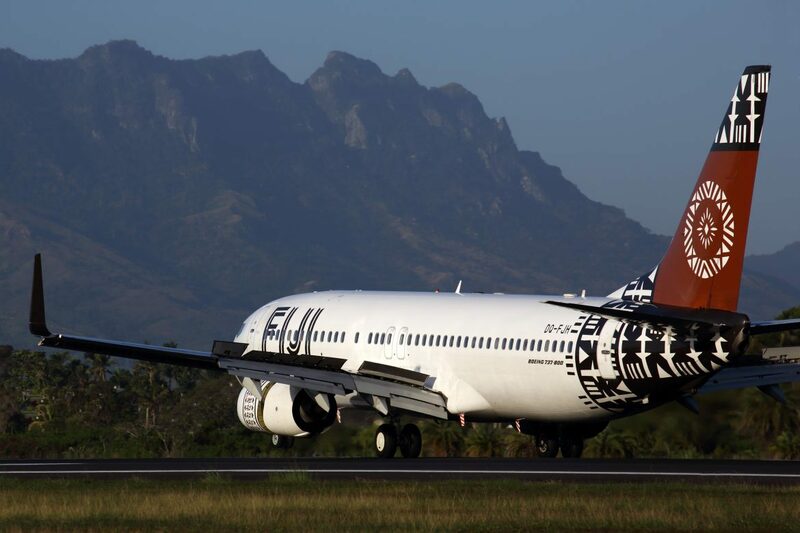 For example, the deal with Alaska, signed as recently as March, enables Fiji Airways to place its ‘FJ’ code on Alaska Airlines’ flights from San Francisco to Seattle and Portland. 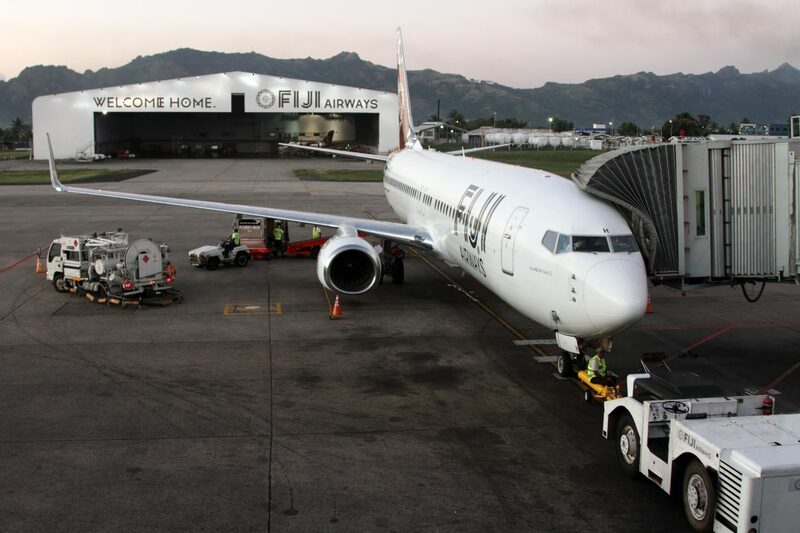 “This codeshare agreement is a major milestone for Fiji Airways as we continue to grow our network and expand our footprint in the region,” said Viljoen. The deal with Hong Kong Airlines allows its HX code to be placed on Fiji Airways’ flights between Hong Kong and Nadi, as well as Nadi and Auckland. At the same time, Fiji Airways will put its FJ code on Hong Kong Airlines’ flights between Hong Kong and Bangkok, Tokyo and Osaka. With Qantas, passengers will now be able to travel on one ticket to Nadi from major Australian cities and regional areas, including Perth, Hobart, Canberra, Darwin, Townsville and Rockhampton, with quick connections via Sydney or Brisbane. Partners closer to home have also not been ignored. Last year it signed a codeshare with Solomon Airlines, the national carrier of the Solomon Islands, as well as forging a memorandum of understanding with Samoa’s new airline, Samoa Airways, to jointly pursue a range of commercial opportunities. Under the proposed partnership, Fiji Airways provided initial support to Samoa Airways to help launch its international services to and from Apia to Auckland and Sydney through the use of its established infrastructure in sales, commercial, operations and maintenance. It also opened up Samoa to link into Fiji Airways’ long-haul network through Nadi to Los Angeles, San Francisco, Hong Kong, Singapore and, in the future, Japan. Singapore is an example of the strategy of phased growth being employed by Viljoen. The carrier launched services to the city-state in 2016 with two flights a week. In November last year it announced that from April this year it would add a third direct flight during peak seasons, aimed at growing the route to capitalise on growing demand from Singapore and Southeast Asian travellers for Fiji as a holiday destination, as well as from Fijians travelling to Singapore and India. “The number of Singaporeans travelling to Fiji increased by 120 per cent between 2015 and 2016, while Southeast Asia and India have been significant feeder markets. Through the introduction of our thrice-weekly services during peak periods, we hope to provide greater flexibility to travellers from this region,” said Viljoen. “Visitors can now opt for vacation days that best suit their needs, be that a short four-day trip, or a longer nine-day holiday. Domestic and short-haul regional subsidiary FijiLink has also been getting a facelift. 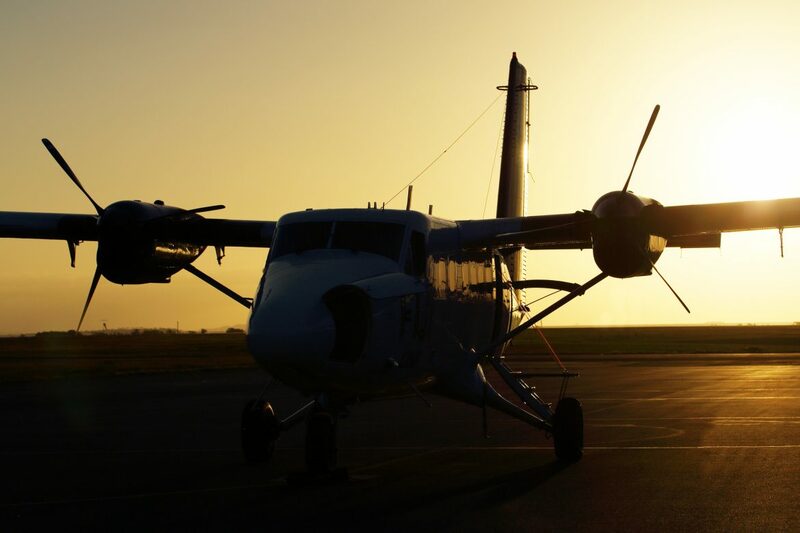 With one ATR 42-600 and two ATR 72-600s in its fleet, in March it took delivery of a third brand new Viking DHC-6 Series 400 Twin Otter, increasing the Twin Otter fleet to four (with three Series 400 and an existing Series 300 Twin Otter already flying). The airline has an option to order a fourth Series 400 Twin Otter and will make a decision on this at a later stage. “All our aircraft, even the smallest, have a strategic and significant contribution to our airline and its success,” said Viljoen. The Twin Otters operate domestically in Fiji from Nadi and Suva to Rotuma, Lakeba, Kadavu, Cicia, Vanuabalavu, Taveuni, Koro and Savusavu. Looking to the future, another breakthrough has been the start of work on a Fiji Aviation Academy, expected to open in March next year. As part of Phase 1 of the $60 million project, the academy will house two CAE full flight simulators for the 737 MAX and A330. “Fiji Airways and Fiji will have a world class aviation training facility, offering the highest standards of pilot training in the world. It’s part of the continued growth of Fiji Airways and our contribution to Fiji,” said Viljoen. The academy is spread out over 2,600 square metres at Nadi, using the very latest construction and green energy design. It will feature three simulator bays, flight training, briefing rooms, multimedia rooms, along with training, workshop and services centres. It will also house ground training facilities for a flight school (Phase 2) and a cabin crew training facility (Phase 3). If there is a question that is constantly raised by analysts it is the amount of protection Fiji Airways gets from government regulation, which protects it from much competition and allows it to control more than 70 per cent of Fiji’s international capacity. Some observers suggest this may be good for Fiji Airways but it puts the brakes on inbound tourism which would likely rise significantly if the market was opened up. In the meantime, like all airlines, Fiji Airways is hardly immune from the various pressures its counterparts face elsewhere. Viljoen says the outlook for 2018 is challenging given the pressure of fuel price increases, increased competition, and volatility of the US dollar. “Fuel prices will continue to be a challenge for all airlines and we will not get complacent with the fiscal discipline required to meet our financial targets. It will, however, be an exciting year for Fiji Airways as we become the first airline in the region to receive and operate the brand new Boeing 737 MAX 8 aircraft on our short-haul markets of Australia, New Zealand and the South Pacific. It’s an excellent airline. I flew back from Fiji on the airline last December. Great staff, clean aircraft, excellent pilots & it shows. I’m heading back to Fiji in September & look forward to flying with them again. If Fiji Airways, a wholly owned Fiji Government enterprise, subsidised heavily by the Fiji Government and has a virtual monopoly on its routes with a high fare structure, did not make money on its lucratuve routes, one would be most worried. If flights into Fiji werexopned to real competition and market forces, tourism into Fiji woukd double with competitive fares on the routes, creating a much needed boom for its tourism industry and creating many more jobs in this service industry. 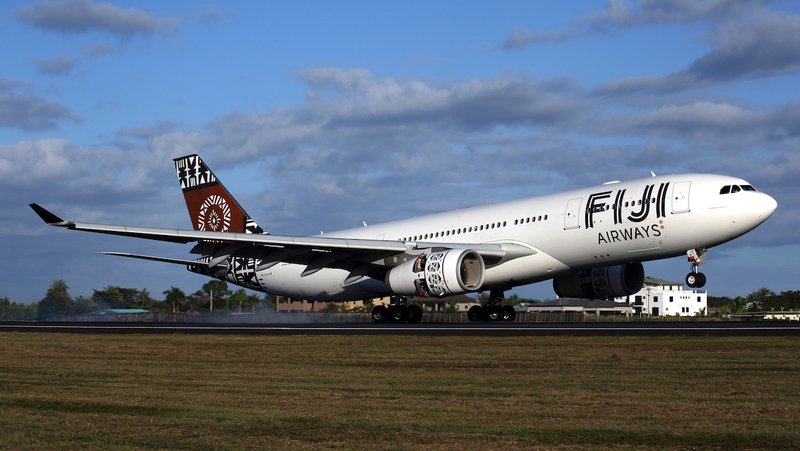 Fiji Airways enjoys heavy protection from the Fijian Government. It is a closed market. When will Fiji Airways start direct flights to Canberra? What a pain travelling to Sydney or Melbourne to catch flights to Nadi. FJ did fly CBR/NAN/CBR nonstop twice a week, around 8-10 years ago for a very short period. It was a disaster. Similarly for OOL/NAN/OOL. Last time I look Fiji govt owned 50.1% of FJ, QF 46%, NZ around 3.7% & other Pacific nations the rest. From SYD you can fly JQ to NAN & from BNE, SYD, MEL, VA.
Fiji should turn itself into a hub like NZ has to AKL. How many AUstralians fly to LAX, SFO or YVR via AKL ? Quite a lot I would suspect. Air Pacific/Fiji Airways(FJ) used to always be the cheapest direct way to USA west coast. Like Air NZ they have a geographical advantage, as it seems most nonstops to USA from BNE, SYD & MEL go almost overhead NAN. Lately, FJ fares to USA have gone up a lot in peak season. They seem to be concentrating on Asia & OZ/Fiji, which seems to be booming partly due to Bali volcano. Surely FJ can make money OZ/USA & still undercut the big boys ? When the new Boeing 737 MAX8s arrive beginning november, Fiji Airways will have probably the youngest fleet of A330s/737MAX8s/ATR 42&72/Dehaviland Twin Otters. Good job Andre Viljoen & hope you are bot the target of bigger carriers like QANTAS, for a very long while.😁. Fiji Airways are now looking at three aircrafts for its long haul market; Boeing 787 (8 & 9)/ A330 NEO (800 & 900) and the expensive A350 (8 & 9). However, I would expect the Perth to Nadi direct route soon, post the Nadi to Narita (Tokyo). The new 737 MAX8s should provide more comfort to Adelaide travellers with potential for direct Hobart/ Townsville /Darwin / Gold Coast soon. Future looks bright for FJ , provided they stick to the Boutique Airline segment BRANDING , like it’s done thus far. I hope Fiji Airways orders the new Airbus A330neo with Full Lay Flat beds. Not the angle ones like they have now. hopefully Fiji airways would go the Boeing 787 dream liner…rather than the expensive Airbus A350….the dream liner has more cargo space than the a350… just what Fiji Airways needs.